This document will show you how to link your Time Doctor company account to your Slack account so that notifications regarding your team's activities will appear in the chosen Slack channel in near real time (click here for an example of what you'll see). 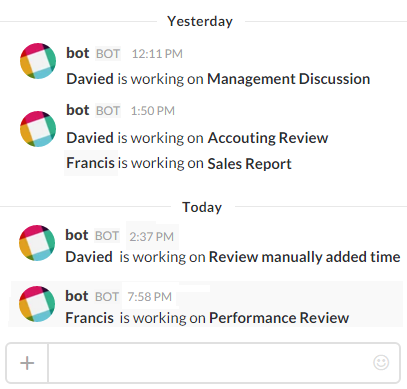 There is a one minute delay between the time a user begins tracking time and a notification is posted to the slack channel. Before you begin, create a Slack account if you don't have one already. Regular users and managers don't need to take any action to integrate Slack - only Time Doctor account owners or admins can enable this integration. That's all there is to it! Now just keep an eye on that Slack channel for updates on who's working on what!